Home › Articles › Columns › Victoria Law on Politics › Will Filming the Police Keep Us Safe? For decades, grassroots activist groups like CopWatch have been trying to take this approach with the police, monitoring police officers in person and encouraging citizens to film their interactions. In recent months, police forces around the country, from New York to Portland, have begun work to phase in body cameras on police officers. If police officers know that they're being filmed, the reasoning goes, they will be less likely to engage in abuse. And if things do go wrong, use of excessive force will be easier to prove. But do police really behave better if they know that they're being watched? Does the presence of a camera deter bad behavior? Does having video documentation lead to greater accountability? Sadly, recent events tell us that cameras alone will not stop police violence. Nearly everyone knows the story—on July 17, 2014, police officers approached 43-year-old Eric Garner who was selling loose cigarettes. Despite the NYPD ban on chokeholds, Officer Daniel Pantaleo placed Garner in a chokehold and, even when Garner repeatedly told him, “I can't breathe,” didn't let him go. Garner died. Garner's last minutes were captured by not one, but two cameras, which is how the moment-by-moment details of his death became national news. But knowing that he was being filmed did not stop Pantaleo, who even went so far as to wave at one of the two cameras documenting his assault. Cameras did not deter Pantaleo from using a chokehold that the police department had banned. Cameras did not get any of the other police on the scene to intervene and stop their fellow officer. On December 4, 2014, a grand jury decided not to indict Pantaleo. Even with video footage of a police officer fatally violating use-of-force policies, twelve people still didn't agree that there was enough evidence for Pantaleo to stand trial. Lack of accountability for police violence, even with video evidence, is not an anomaly. In 1991, five Los Angeles police officers beat Rodney King, a 26-year-old black man. His beating was captured on video by George Holliday, a nearby resident. Holliday attempted to give the police the video, but they ignored him. He then turned it over to the media, which replayed portions of it, sparking national outrage. Nonetheless, the officers were acquitted in 1992, leading to the six-day Los Angeles riots. More than twenty years later, we see that little has changed. What Effect Do Cameras Have? 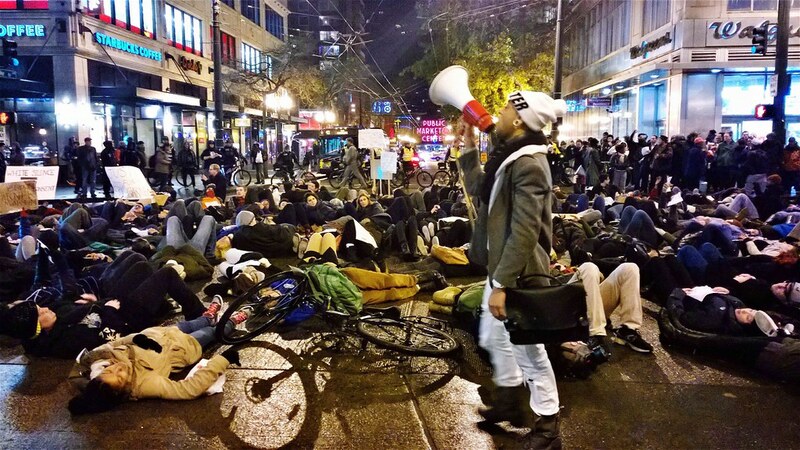 A Seattle protest of the failure to indict the police officer who killed Eric Garner. Photo by Scottlum. The lack of an indictment for Pantaleo doesn't mean we should dismiss the role of cameras—and filming the police—as a useless tactic. Video footage has helped make police brutality widely known. It’s sparked a national conversation and has been a key part of mobilizing massive protests. If not for the video documentation of Garner's death, the police would have been free to argue that Garner had somehow brought this violence upon himself. But with the videos, it should be clear to everyone that Garner did nothing that could remotely justify being choked to death. The final, pleading words caught on tape became a national call-to-arms. Will the body cameras actually reduce NYPD violence? Experiences in other cities show that filming the police is not a clear-cut solution. In Rialto, California, a suburban city near San Bernadino, police now wear body cameras that record all of their interactions. A year-long study found that officers who weren't wearing body cameras were twice as likely to use force as those who were. During the first year, use of force by officers declined by 60 percent. In addition, civilian complaints against Rialto police fell 88 percent, although some experts note that the decreased complaints may stem from civilians not wanting to contest their own behavior in these videos rather than a substantial decrease in police abuse. But elsewhere, the cameras have run into problems. Houston has a pilot program in which police officers wear body cameras. But in December 2014, during one of the many protests against police brutality that rocked the nation, the chief of police ordered all Houston officers to switch off their body cameras. The actions of the Houston police department during the protest is not an isolated case. There have been reports in which police turned off their cameras shortly before assaulting others. In Albuquerque, a police officer turned off his body camera before fatally shooting nineteen-year-old Mary Hawkes. It turned out this wasn't the first time that he had turned off his body camera; an investigation found that he had done so on several other occasions. In August 2014, one month after Garner was killed in Staten Island, a New Orleans police officer turned off her body camera. She then stopped 26-year-old Armand Bennet and shot him twice. Fortunately, Bennet survived. Even if police don't turn their cameras off, there's no guarantee that victims and family members will be able to see the footage. Take the November shooting of 12-year-old Tamir Rice by Cleveland police. Rice was playing with a toy gun in a park when a police car pulled up, officers jumped out and fatally shot him. When his 14-year-old sister ran over to help her brother, police pushed her to the ground, handcuffed her and placed her in the back of the squad car. A surveillance camera from a nearby recreation center captured the entire episode. But just because footage existed didn't meant the family—or the public—could see it. City officials initially refused to release the video. Only after the Northeast Ohio Media Group hired an attorney, and after three weeks of demands, did the city agree to turn over a portion of the 90 minutes of requested footage. It's too early to tell whether the video of the twelve-year-old Rice's murder will sway a grand jury. At the same time, the video allows the family to see exactly what happened during their son's last minutes. Having video provides hope that there will be some reckoning in their son's death and that someone will be held accountable. Without that video, the family might have been left not just with grief and outrage, but also with many more questions about what happened in the park that afternoon. Can Cameras Prevent Violence Outside the Public Eye? An NYC protest in December filled the streets with demands for better policing. Photo by Christian Matts. Body cameras will record police interactions with the community, on the street and on patrol. But what about places outside of the public eye—like police precincts and local jails? Would the presence of cameras prevent violence and abuse of people arrested and held while awaiting their day in court? Just as filming police interactions has not led to prosecution of police officers for excessive use of force, cameras inside jails and precincts are not a guarantee of justice. Take the recent death of 18-year-old Sheneque Proctor, for example. Proctor, a new mother and recent high school graduate, was at a party with friends in Bessemer, Alabama, on November 1st. She was arrested when police responded to a disturbance call. According to her mother, she was slammed into the police car, handcuffed and then thrown into the backseat before being taken to the city jail. Despite her asthma, officers pepper sprayed her after she slipped out of her handcuffs twice. She was later decontaminated from the pepper spray, placed in a holding cell and kept overnight. According to jail staff and the people in the adjacent cell, Proctor was snoring loudly all night. At 4 am, the officer bringing her a breakfast tray found Proctor unresponsive. At 4:40 am, she was pronounced dead. The coroner's report, finding traces of drugs in her system and no signs of potentially-fatal trauma, ruled her death an accidental polydrug overdose, but her family wants answers. Was Proctor, who suffered from asthma, denied medical treatment during her last few hours? Was she properly decontaminated from the pepper spray? Proctor's last night was filmed by cameras inside the jail, but so far the city has refused to allow the family to see the footage. Even with the presence of cameras, the family still has no definitive answers as to why their loved one died or what to tell Proctor's six-month-old son when he gets older. That raises questions: What good are all these cameras if they don't prevent violence and abuse? What good are they if they can't provide answers as to what really happened? Just who are they meant to protect? 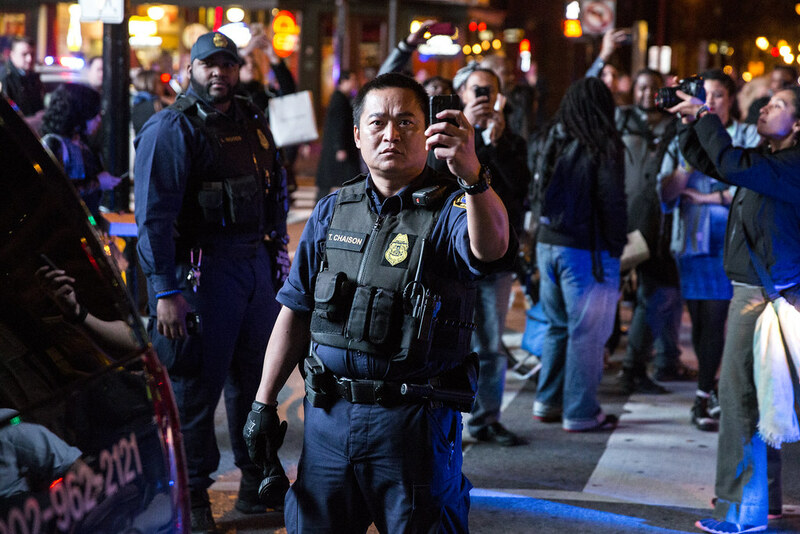 An officer films a Ferguson protest in Washington, DC while protesters film him. Photo by Russell Brammer. Cameras themselves can also be an invasion of privacy. In September, I wrote about about the right to privacy in jail, reporting on a case where male guards videotaped female strip searches at a local jail. Since September 2008, the Western Massachusetts Regional Women's Correctional Center had filmed 274 strip searches. The officer holding the video camera was nearly always male. The jail justified this practice by arguing that videotaping the searches prevented abuse. The jail ignored the fact that videotaping women being forced to undergo such a humiliating and invasive procedure is abuse in and of itself. Women who had been forced to undergo these documented strip searches filed a class-action lawsuit and won—a federal judge ruled that allowing men to videotape women's strip searches was unconstitutional. The sheriff's office is currently appealing the ruling but has discontinued the practice. It turns out that Western Massachusetts isn't the only jail in which strip searches are routinely videotaped. At the Puyallup County Jail in Washington state, people arrested for DUIs were videotaped as they undressed and used the toilet. In some cases, jail staff demanded that they strip. One woman recalled that jail staff ordered her to undress in a cell. After she changed into a jail uniform, a guard demanded that she strip again. The surveillance footage was available to anyone who made a public records request. Although it hasn't been decided yet, the suit has had some effect: As of December 2013, the jail had stopped recording the holding cells. The jail administration also destroyed all preexisting footage except the videos that had been introduced as evidence in the lawsuit. The district court ordered that those videos be sealed. The justifications by jail staff and their attorneys in both Western Massachusetts and Puyallup demonstrate that, in the hands of police and jail staff, cameras are meant to protect the staff, not the people they guard. However, there has been at least one recent incident in which jail cameras have backed up claims of human rights violations. In May 2013, 33-year-old Dana Holmes was arrested for a DUI in Illinois. At the LaSalle County Jail, she was pat searched (or searched over her clothes) by a female guard in a room with two male guards. After she leans to one side, she was tackled by the male guards and then physically carried into a holding cell, where she was stripped naked and left with only a blanket to cover herself. Over an hour later, jail footage shows Holmes wearing only a blanket as she is fingerprinted and photographed. In Illinois, officers are only allowed to strip search a person if they have a “reasonable belief” that that person is hiding a weapon or controlled substance on their body. The law requires that the strip search be done by an officer of the same gender. Both were disregarded in Holmes's case. Holmes sued. While the guards claimed that the strip search was necessary because Holmes had been uncooperative, the video footage proved this to be a lie. Five other people who had been subject to similar searches joined her suit. The county settled with Holmes and the other plaintiffs in April 2014, awarding $355,000 in legal fees and settlement costs to the six people. In the past, video footage has led to larger changes in the prison system. In 1994, an all-male riot squad storming into Canada's Prison for Women after a fight broke out between several guards and prisoners. Called in from a neighboring male prison, the squad was armed with riot shields and batons. They shackled, stripsearched and forcibly removed women from their cells. They videotaped the entire procedure. In February 1995, the Canadian Broadcasting Centre aired the footage. The broadcast sparked a public outcry about conditions inside the women's prison, which advocates had been condemning for years. The video did what years of advocacy had been unable to do—open a government inquiry that ultimately led to the closing of the prison in 2000. Twenty years later, however, video of civil and human rights abuses often fail to spark that same level of public condemnation. As we've seen over the past year, we can watch a police officer choke a man to death and still decide not to indict him. We can see police shooting a 12-year-old and manhandling his 14-year-old sister, be outraged for a few minutes, then go on with our lives. Cameras alone will not end police abuse. When we see them promulgated as solutions to police violence, we need to ask ourselves why and who benefits. Requiring body cameras further increases police budgets to cover the costs of this new technology. At the same time, the roots of police violence—racism, a callous disregard of human life, and the violence inherent in the institution itself—remain ignored. These questions are not meant to dismiss the activism of monitoring the police, whether through individual attempts like Ramsey Orta's cellphone video of Garner's murder or organized efforts such as CopWatch. But we have to be cautious when these forms of activism get hijacked into calls for increased surveillance, including body cameras, and an accompanying enlarging of police budgets. But when we focus solely on cameras as solutions to police violence, we ignore the fact that policing is an institution based on violence. As we talk about cameras, we should also ask ourselves whether we can actually change an institution that is inherently racist and violent. Should we even bother trying or should we put our energies into dismantling it and creating alternatives that truly keep us and our communities safe? 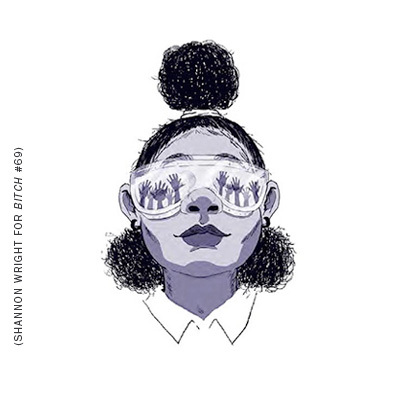 Related Reading: Remembering the Black Women Killed By Police. Cameras help but the only long lasting solution is good cops standing up to the bad cops. Until then bad cops will find a way around being videoed. They'll switch off the camera or move to a spot out of the cameras view or give them the "rough ride" to jail.